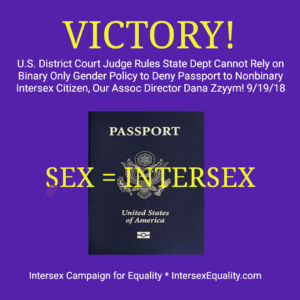 Hida Viloria | U.S. Judge Rules in Favor of Nonbinary Passport! I couldn’t be happier or prouder about this news today, and to have played a role in it! Having a District Court Judge of the United States — where surgeries aimed at erasing intersex people from society originated, over half a century ago– acknowledge our right to be accurately identified as neither male nor female, is revolutionary. Read more about Dana and the lawsuit here. ← Amplifying Intersex Voices in the Intersex Quarterly!